What important advances did Robert Goddard propose? Robert Goddard (1882–1945) was fascinated by the prospect of space travel and rock-204 etry at an early age. In 1919, he published a now-classic work on his rocketry research, Method of Reaching Extreme Altitudes, in which he proposed the possibility that a rocket could eventually reach the Moon. After a number of experiments and early failures, Goddard launched the world’s first liquid-fueled rocket in 1926. This 10-pound (4.5 kilogram) rocket, launched from a cabbage patch in Auburn, Massachusetts, went up 41 feet (12 meters) and traveled a distance of 184 feet (56 meters). Over the next two decades, he greatly advanced the field of rocketry, working out systems for various stages of rocket flight from ignition and fuel system to guidance controls and parachute recovery. 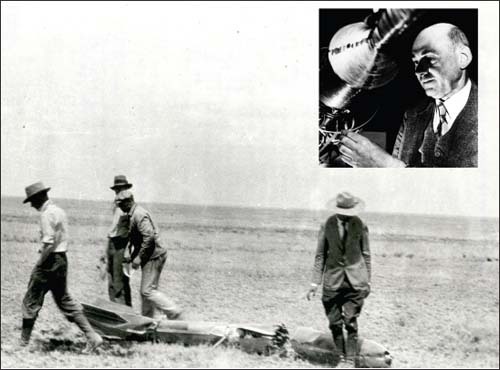 In 1930 Goddard set up the world’s first professional rocket test site in Roswell, New Mexico, successfully launching rockets as high as 1.3 miles (2.0 kilometers). NASA’s Goddard Space Flight Center is named in honor of this rocketry pioneer.